San Diego DJ, Justin Kanoya, works the Fitbit Local event at Belmont Terrace with Mike Sherbakov and Sheri Matthews. I got together with my Fitbit Local ambassador friends, Mike Sherbakov and Sheri Matthews, for a second round of working out on a rooftop overlooking the beach. We did this mid-year Fitbit party last year, and this years was just as fun. Bonus: it took place on my birthday, which means I got serenaded by 100-plus strangers. Good times. Fitbit Local workouts are always fun and free. Big thanks to the Belmont Terrace for having us out, as well as Suja and Perfect Bar for continued support! San Diego yoga DJ, Justin Kanoya, with Corepower Yoga teacher, Amanda Mays after a live DJ'd yoga workout. The year closed out with two final yoga workouts I DJ'd with Katie and Amanda at Corepower. I'm looking forward to more of these in 2016. Here's a look at the setlists for both. Pacific Beachfest Sunset Yoga and 5k took place on October 1, 2016. High Performance Movement is a San Diego based event production that specializes in putting together races such as the Corporate Dash 5k, Santa Run and the annual Pacific Beachfest 5k. I’ve had the opportunity to DJ a few of their events, but was very excited when they asked me to be a part of their first ever yoga event. 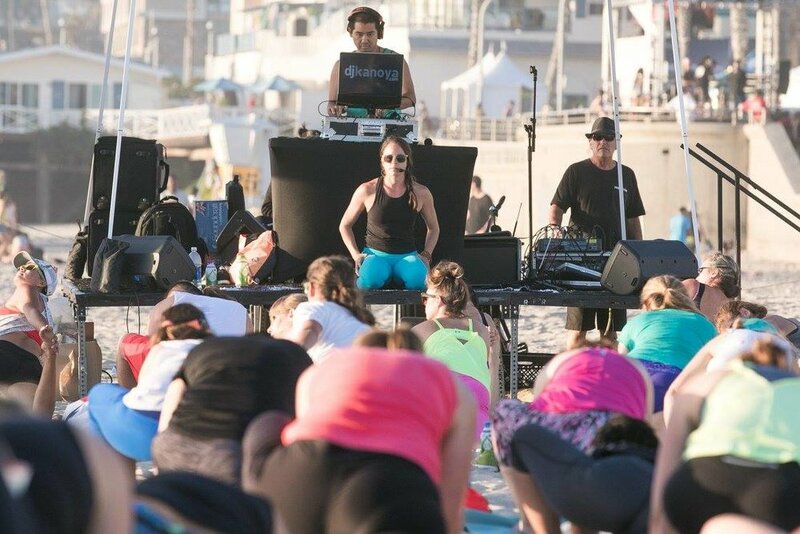 The Sunset Yoga and 5k was an addition to the Beachfest 5k this year. The “competitive” race took place in the morning, while the yoga/run occurred later in the day - hence the name Sunset Yoga. It was the first time I’ve DJ’d on a beach, and since I was set-up early, I figured I might as well play tunes for those sunning themselves on sands of Pacific Beach. Below is the setlist I played prior to the yoga start. And further down is the set for the yoga session led by my good friend, Lauren Padula.